So here it is. Proof that somehow, I got around the 26.2 miles of the London Marathon, without passing out, vomiting or just giving up and sitting down in the street – all of which I felt like doing several times. It was so hard. I really, really underestimated how hard. Having run 18.9 miles in four hours, I reckoned I might be able to manage 26 in five. But I reckoned entirely without the extraordinarily cumulative effect of tiredness upon tiredness; ache upon ache. Until now, the most gruelling time of my life was trying to stay awake through Wendy’s 72-hour labour with Tom, our first boy. But let’s face it, the gruel level was stratospherically higher for Wendy herself. All I had to do was keep my eyes open. This was so much tougher. Not as emotionally draining, but physically unbelievable. At the Red Start, feeling a bit funny. The atmosphere at the start was pretty amazing. We were herded into our zones (I was in Zone 8, Marathon completists), and stood about for what felt quite a long time, but without any whinging or grumpiness. It didn’t hurt that the sun was out properly for perhaps the first time this year, which boosted spirits enormously. That was exactly it. 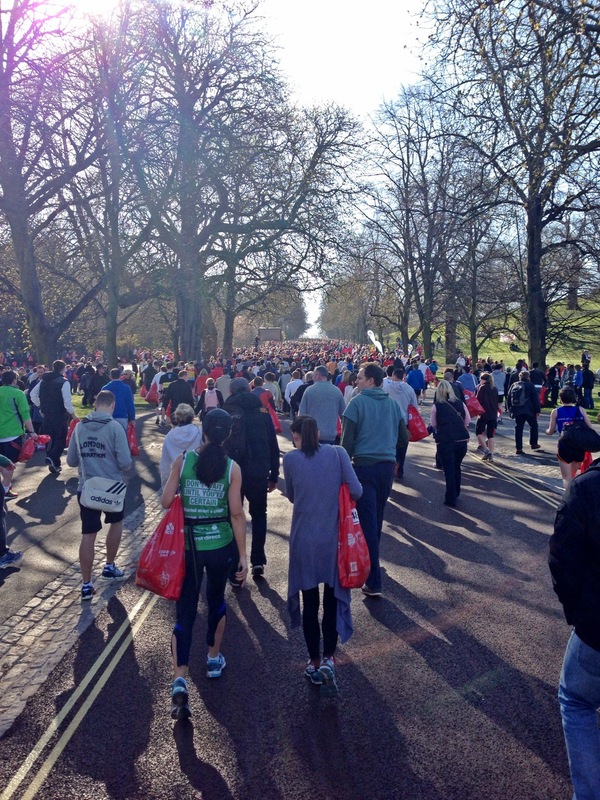 Running the frost-hardened fields of Surrey, the viciously cold Manhattan streets, or the balmy stretches of the Golden Gate Bridge, the idea that at some point in the future I’d actually be starting the real, live London Marathon felt like a fantasy. Then they announced the 30-second silence for Boston. I half-heard the guy on the PA telling people it was coming, but it seemed to be lost among the excited chatter of 35,000-odd people. Then the whistle blew, and silence fell like a window slammed against a storm. Standing among those thousands of people, in the capital city, with not a word spoken – not even a stifled cough or sneeze – was extraordinary. Then we were shuffling forward, bit by bit, and the reality began to dawn that I was actually here, and would actually have to run those 26 miles or look very silly indeed. By 18 miles I knew I was in for an incredibly tough final stage. My hip-flexes (as I’ve learned to call them) were really complaining, and it felt like I was being kicked quite hard in the arse every few steps. I’d started to allow myself short walk rests, but it was increasingly hard to get started again. All the way round, though, the crowds were incredible. I was glad that I’d been advised to write my name on my vest – you can’t deny the psychological force of people shouting , ‘Come on Mike, you can do it, Mike!’ all the way round. There was also a fire station at, I think, about 8 miles, where one of the guys had the fire hose spraying into the road – I ran over to it and straight through the water, which was blissful in the unexpected heat. But even with all the incredible support, I found myself heading towards Victoria Embankment and the final stretch feeling sure I’d have to walk the final couple of miles. Indeed, I was walking as I went into what had been temporarily branded ‘the Lucozade Tunnel of Yes’, which had been decked out in lights beaming encouraging slogans. But I decided I really wanted to be running when I saw the family again – they were at the ICAN station on the 25-mile mark. I’d run to there if I could, I decided, and then see how much more I could do. 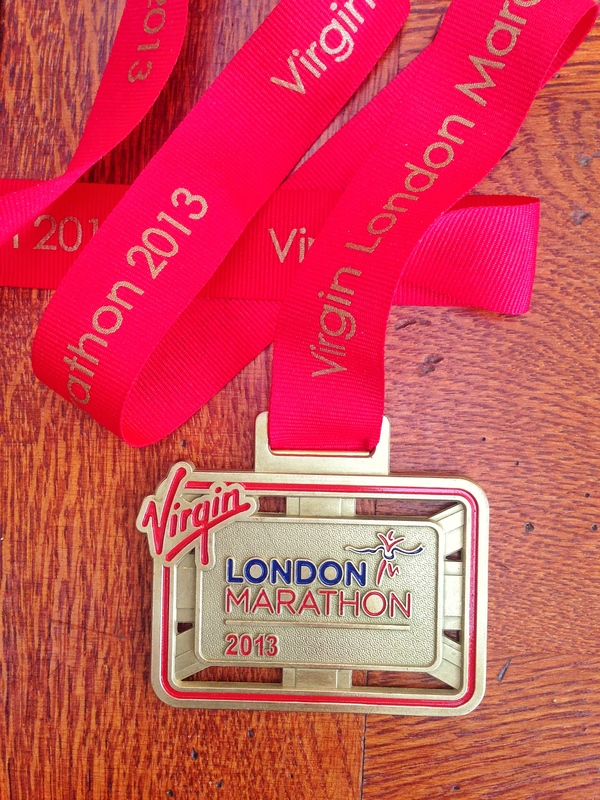 I managed it, although my running was, by then, little more than a trot. I said hello to the family, and it was lovely to see them. Then I set off again, and told myself: less than a mile, less than a mile. The crowd was really critical now, and they rose to the occasion wonderfully, cheering all of us slower runners on to the end. It was absolutely a matter of just one more step, but somehow I kept running around past Big Ben, up to St James’s Park, and down to the 800 METRES TO GO! sign. After that there are signs every 200 metres. I remembered, right at the beginning, there’d been a sign saying TOILETS 200 METRES, and the toilets seemed to appear almost instantly. So 200 metres really couldn’t be that far, right? 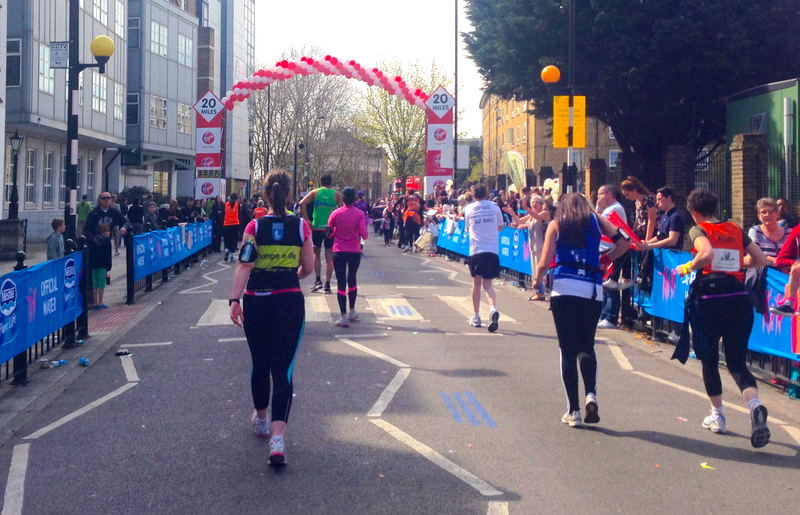 I tell you: the intervening 26 miles make each of those final 200-metre stretches feel like a marathon in itself. But I found that I was still just about meeting the technical description of running as I stepped onto the pink surface of the Mall. By this point you’re hearing your name as a near-constant throb in your ears, which is a pretty incredible feeling. If I could run this far, I decided, I could bloody well run across the line. And I even picked up speed – probably by about 0.25% – as I hit that final short straight of the Mall to the big clock at the end. Crossing the line felt, at that moment, far more like relief than triumph. I was well and truly done in, with a constant piano-wire of pain on the inside of both hips and a very sore bum indeed. Even mounting the little raised platform you have to go onto to let them take the timing tag of your shoes felt like a challenge. And the walk to collect my bag, and then find the family in Horse Guard’s Road, seemed to take forever. But I found them, and they gave me a Penguin and let me lie down. Which was heaven. Then I had a blissful hot bath, fell asleep in it, tried to sit up on the sofa with Wendy, fell asleep again, and took myself to bed. I slept like a log for nine hours. It was quite a day. But looking back, the exhaustion and pain fade very quickly in comparison to the overriding delight in people sharing something very special. The connection with the crowds really is quite overwhelming, especially when they know your name. And the sense of people getting together ultimately to help others – charitable giving is definitely the dominant theme of the day – is fantastic. Especially after the horrors of Boston, it was impossible not to feel one’s faith in humanity re-ignited. In the end, there were two bombers in Boston, against tens of thousands of runners, and millions of supporters – at the events and watching on screens. As the news continues to feed us stories – important stories – of the evils of the world, it’s worth being reminded that the odds are still stacked in favour of the good. I even think I might have another go next year. And that really is saying something. 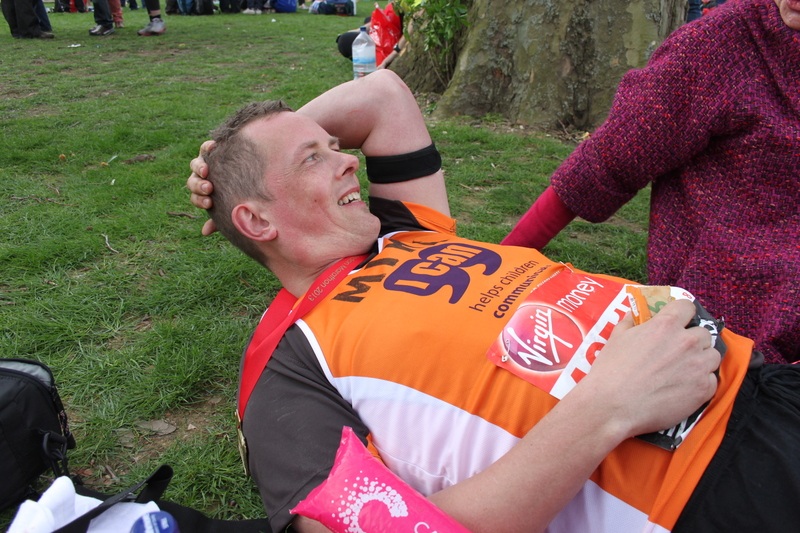 Last of all, thank you again to everyone who’s sponsored me. It’s been phenomenal. I hoped to raise £2,000 for ICAN, and the total as I write is £2,415! With Gift Aid on top, that’s very nearly £3,000 for this superb charity. THANK YOU. You’re amazing. 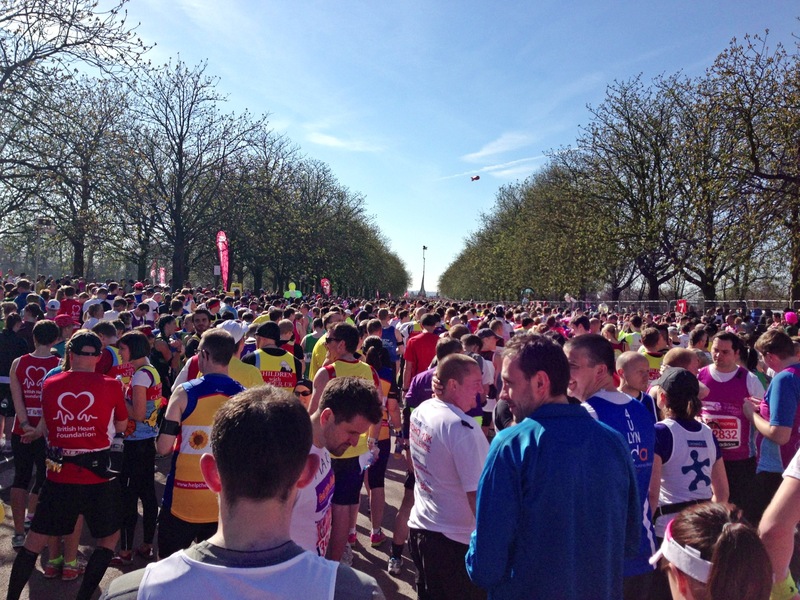 This entry was posted in Marathon Day, Uncategorized and tagged ICAN, London, Marathon, Running on 23 April, 2013 by reedwords. This was the biggest run yet (here it is on Nike+), and will be the biggest until I get to the Marathon, just three weeks away now. Helen Esplen, the physiotherapist, had recommended I run an 18-miler this weekend, and then taper it off until the Big Day. So that’s what I set out to do. And, thank goodness, that’s what I did. In fact I ran 18.9 miles, if you want to be pedantic about it. And believe me, I do. When every yard is a fight to stop yourself stopping (if you know what I mean), you want to count them all. I tried to stay away from any major hills (successfully, I’m happy to say), running at first the same road I ran last weekend, to Leatherhead (5.7 miles away). This time, thankfully, I wasn’t in the teeth of a bitter, snow-flecked wind (although snow came and went throughout the run), and when I hit Leatherhead I kept going, running around the edge of the town centre out towards, and then through, Great Bookham. Running this far, especially on your tod, means one of the great dangers is boredom. Good news, then, that I could plug into my phone, which is stuffed with Mayo & Kermode ‘Wittertainment‘ film review podcasts I haven’t otherwise had time to listen to. The latest two of those got me through about two thirds of this run. Between Bookham and Effingham (which sound like unsavoury verb constructions: ‘Don’t book ’em while I’m effing ’em’), I cut left back towards Dorking (which sounds like a rather rude gerund itself), taking a slightly mistaken detour towards Polesden Lacey. Retracing those steps, and listening to Kermode and Mayo’s entertaining interview with the great David Morrissey, I was passed by a cyclist who slowed down enough to ask how far I was running today, and (when I revealed it was 18 miles), asked if it was for the London Marathon. I said it was, and he said that was brilliant, and wished me luck. 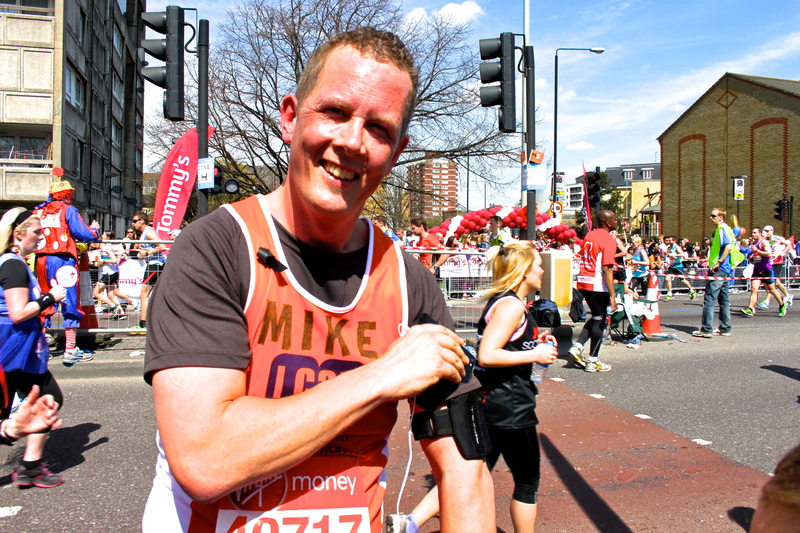 Very decent and cheering of him, and a good fillip at that point – somewhere between 10 and 11 miles. I found the right road – Chapel Lane – and headed towards Westhumble, with the sun suddenly breaking out and making the day feel remarkably springy. 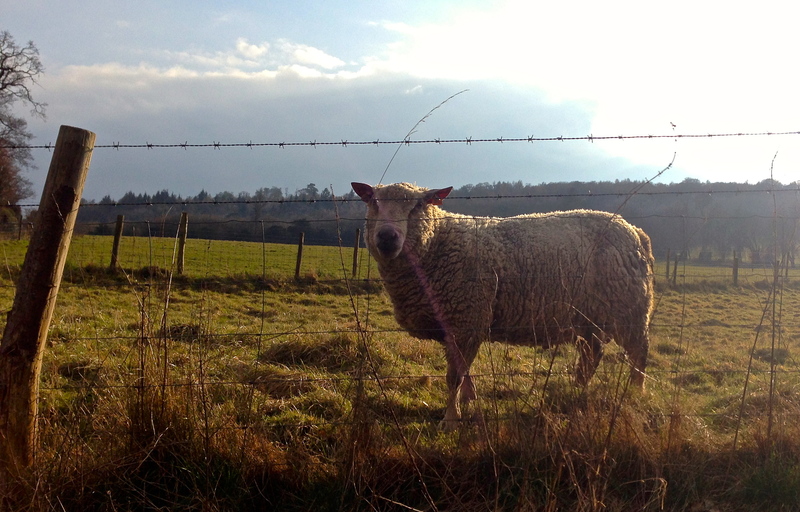 Westhumble sheep, with rare glimpse of sunshine. I must have driven through Westhumble before, but running through the village I was struck by how ludicrously pretty it is. I passed beautiful house after beautiful house, snuggled in among winding lanes and ancient trees. If you were looking for a slice of Hollywood England, it would be as good a place as any. As I came round the bend to Westhumble station, I came upon a family of walkers. The man pushing the buggy said, ‘Blimey, you’re covering some distance! We saw you an hour and a half ago!’ I felt a bit rude rejoining with little more than ‘Really?’ but I didn’t dare stop – I’d run about 13 miles by this point, and knew there were five more – about 8km – required. I hope he didn’t mind. I hit the A25 and set off back towards Leatherhead again, knowing that it was 5.7km from my house to the town. So if I ran almost there, and then back again, I’d be fine. I’d gone quite a long way before my brain caught up with itself, tapped itself on the shoulder and reminded itself it was 5.7 miles to Leatherhead. Not kilometres. Laughing ruefully at myself, I saw that if I turned around now and ran home, I’d actually do about 20 miles in total. Hey ho. And so I ran back, with the sky turning from Quite Nice to Worryingly Glowery as I went. Snow speckled the air, and I hoped very much that it wasn’t about to get really nasty. It didn’t, but it was cold enough for me to stop and put the trusty Howies merino back on. (I’d taken it off quite early in the run, surprised by how mild the day was.) I’d brought energy gels with me for the first time (and I’m profoundly glad I did), but they were gone now. It was just me and the road, all the way home. Well, I made it into Dorking and through the park, all the way to Pump Corner, the base of the climb towards our house. (Why did we have to buy a house on a hill?) By this point I knew I’d passed 18 miles, but I was hoping I might squeeze 20. But there was virtually nothing left in the legs. Or in the phone battery, and I was damned if I was going to miss having this run recorded. So I let myself stop, and hit End Run on Nike+ Running. 18.9 miles. I was shattered. 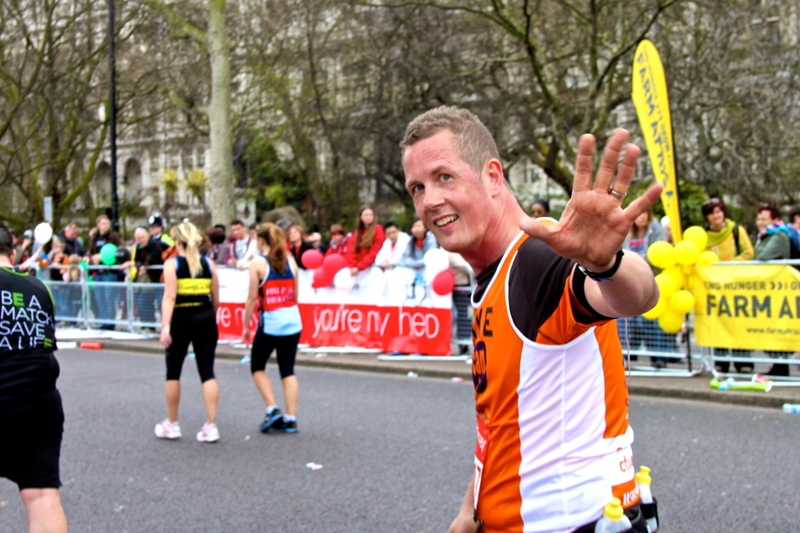 But hey – the Marathon’s only another 6.3, right? I shall buy more gels, and hope the crowd carries me the rest of the way. Postscript: The day after this run I went to see the wonderful Karen Marshall, my personal trainer. I explained what I’d been up to, and threw myself on her mercy. I’m sure she was right, but I got home a limp rag of a man. Seriously, I’m working for this run. So if you haven’t already sponsored me, do express your admiration and sympathy by chucking a few quid in the pot if you can. Thanks to the generosity of many (seriously, thank you all), I’m getting very close to my £2,000 target for ICAN. I’d be very grateful if you could help tip the balance. Cheers! 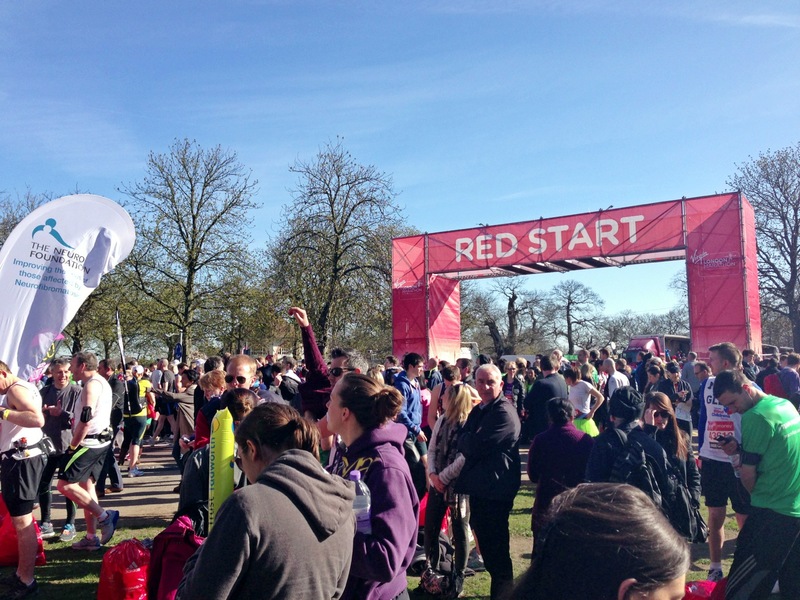 This entry was posted in Fundraising, Running, Uncategorized and tagged Bookham, fundraising, ICAN, Leatherhead, Polesden Lacey, Running, snow, sponsorship, surrey, Westhumble on 1 April, 2013 by reedwords.